Château de Najac with the Seneschal’s House to the left. One of my favourite shots. A little celebration is in order. Life on La Lune will be eight years old on Wednesday, which just happens to coincide with Valentine’s Day. Since February 2010, I’ve published some 586 posts, learned an awful lot about France in the process and, most important of all, been in contact with readers from around the world. One of the great things about blogging is that it opens up a cyber universe of new people. I love our interaction in the comments, which has resulted in some wonderful meetings in person. Thank you for reading my jottings and for making time to communicate. To mark the event, I decided to look back over those eight years and share with you some of my favourite posts, one from each year. This turned out to be much more difficult than I had anticipated. I whittled the 586 down to a shortlist of 35 (!) and then simply had to stick a pin in those to make the final decision. The criteria for inclusion vary. In some cases, they are posts that have proved most popular with readers. In others, it’s simply a subject that still exerts a fascination over me. Glorious French Gardens – inspired by visits to two local gardens, which are the result of dedicated and tireless work on the part of the owners. Getting the Blues: the Pastel Trade in Southwest France – this is one of a number of posts on the blog that look at trades or products that were formerly of great importance to the regional economy. Others are saffron, violets and phosphate mining. Truffle Market at Limogne – truffles are fascinating fungi. No one in France has been able to cultivate them successfully, so their rarity value has led to the nickname “Black Diamonds”. The intimate little market at Limogne is an enlightening initiation into the practices of the trade. The Secret of le Château de la Reine Margot – this is a well-restored example of one of the many châteaux in our area. Generally, they are small and not in-your-face like the opulent palaces of the Loire. This post achieved a huge number of hits in 2016 during the Tour de France, whose route came very close to us. A UK TV commentator pointed out various local highlights, including le château de Saint-Projet. Through the wonders of Google, lots of people found this post. Beaumont-de-Lomagne: Garlic Capital of Southwest France – garlic is so deeply associated with French cuisine that it has become a cliché. When writing a feature for France Magazine, I visited the white garlic capital of the region, and had a lovely day with the garlic growers’ association. Their annual fête attracts thousands of people to savour garlic products and dishes. The Ups and Downs of Life in La France Profonde – it wouldn’t be right to give only a rosy view of life in rural France. It has its good bits and its less good bits. Death of a Village: Oradour-sur-Glane – after I had visited this scene of terrible atrocities by the SS Division Das Reich in 1944, I wasn’t sure if I should blog about it at all. It would be a wonderful thing if we could learn from history, but recurring events like this show that we don’t. It needn’t stop us trying, though. Finding Our House in France – on the 20th anniversary of our first sight of our house, what else could I blog about but the adventures, some unlikely but all true, we experienced to get here? I hope you enjoy this little trot back through Life on La Lune’s existence. And, in case you’re thinking this is the prelude to the blog’s demise, it’s not finished yet. 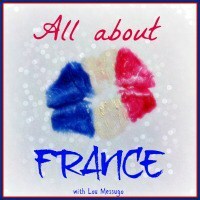 There’s plenty more to say about la vie française. Thank you again for reading. This entry was posted in French life and tagged Beaumont-de-Lomagne, Château de Saint-Projet, French property, garlic, Jardins du Quercy, Limogne-en-Quercy, Oradour-sur-Glane, pastel trade, SW France, truffles. Bookmark the permalink. I delight in your blog and always enjoy new posts. What a lovely way to celebrate a fantastic milestone by gifting your readers with this retrospective. I will read my way happily through those that I haven’t read, savoring each as I have all your posts since I stumbled on you 4 years ago. Keep em coming, you are one of the delights of the blogosphere! What lovely comments! Thank you for that warm, cosy feeling on yet another gloomy day. When are we going to see more of Marcolès? I’ve been all over the place since mid-January …. Paris, England, Switzerland and have been very remiss with writing. I have a very special post about Marcolès for Monday which I hope will make up for the silence! Happy blog anniversary – eight years is amazing, especially at a time when so many things are so short-lived!! I look forward to many more fascinating posts from you!! Thank you for your kind words. When I started the blog, I don’t think I considered how long to continue it, but it seems to have developed a momentum. I would miss writing it if I stopped. But I will continue only as long as I think I have things to write about. Happy eight anniversary. I’m saving the selection of posts for when I’m having r&r after my op. Thank you. Bon courage et bon rétablissement. I don’t think I have seen that post of yours, so I must go and look. I found out a little about Argeles when I read a book about the Spanish refugee camp at Septfonds, not far from us. No, la vie en rose is not always rose. One has to be realistic. I was a bit sad that SF hadnt got you out on a romantic day trip 8 years ago, rather than you having time to sit writing the first post of your blog – but then on second thoughts, perhaps your blog wouldnt exist if that was the case so there are silver linings to the missing romantic event!! Happy 8 years, and to many more! I have always wanted to go to Orador sur Glane. And I think that these things should be written about. Learning from history is so very important, as you rightly say.